Sirius demonstrates ecological values on a daily basis by creating structures that are energy, employing passive solar design, super-insulated approaches. Building materials are chosen with least amount of embodied energy, which means how much energy it took to create a particular item, including the amount of fossil fuels it took to deliver it to you. Plus, non toxic, local, durable, earthen materials are fun to build with! The buildings are constructed out of consciously locally harvested wood and cut either by the community or nearby sawmill. This cuts down the amount of embodied energy. Most wood that people use to build houses is shipped 3,000 miles across the country and most of the wood that is harvested locally is shipped to Canada to be dried then shipped to other destinations. Insulation that we use in our buildings is either made of straw, or of cellulose – ground up newspapers with a little bit of boric acid added as a fire retardant, or cotton insulation – ground up blue jeans. "Built over a ten year period, the community center has many guest rooms and can sleep about 30 individuals. Over 90% of the wood used in this building was harvested locally by us. We managed not take out a mortgage on the building and instead borrowed money from friends and associates at low or no interest, which in the long run saved a lot of money by not paying interest on bank loans. The East Wing was built first and then occupied, and we used recycled materials: wood, windows, hardware, plumbing fixtures – whatever we could find. We also tore down local barns and used salvageable materials. When we first started the building we had very little money so we learned to be creative. 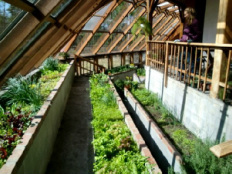 Our greenhouse is passive solar in its design and super insulated which means that it is oriented towards the south, with lots of glass and within it is a large quantity of thermal mass to absorb the excess heat which is generated during the day, even in winter, and radiate that heat back during the night. Examples of thermal mass are concrete, stone, water and soil. This is the basic principle of passive solar design in building. The greenhouse is used for three purposes: (1) growing food; (2) helping to heat the dining room; and (3) as a dining space. In permaculture design the standard practice in creating something is to have it serve at least 3 purposes. Permaculture is a way of looking at all systems and creating them in a way that maximizes output, minimizes input and is as sustainable as possible. We also collect the water from the roof in a cistern which goes through the frog pond and irrigates one of the garden beds and will eventually supply water for the entire greenhouse. The kitchen has a wood cook stove and a super efficient walk in cooler that we built ourselves, which uses a fraction of the energy that a walk-in cooler of that size would use because of its super insulation. We also have a root cellar for storing food, and can, dry and freeze a good amount of our own produce. 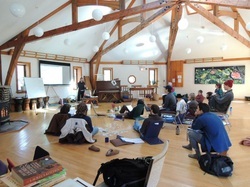 The Octagon is used for meditation, dances, gatherings, rental space for other groups. The Ceiling is a timber frame truss design,a somewhat unusual design by an engineer who also designed the local Peace Pagoda. The dining room – utilizes a 128-year-old ash tree in the middle, and the beams are all cut out of standing dead oak trees that were donated. Tables and benches were built here. We have almost 4,000 watts of solar electricity on the roof, which is a grid inter-tie system. 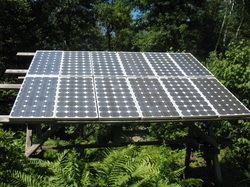 A grid inter-tie system turns the electric meter backwards and reduces our energy needs from the main grid system, i.e., our local electric company. We also have solar hot water panels that produce hot water for the East wing. We have plans underway to further reduce our dependency on the grid produced electricity which comes from coal, oil or nuclear, by putting up a wind generator and a wood hot water system for the West wing. For non-course related information about Sirius, visit their website here.